Adult Skating: The are many opportunities for adults in figure skating these days. It doesn't matter if you started skating as a child and want to take up the sport again, or if you always wanted to learn to skate and finally have the time as an adult, US Figure Skating has tests, competitions, clinics, seminars and other events for the adult skater. There are many all adult competitions held throughout the US as well as Europe. In fact, our club, hosts one of the largest all adult figure skating competitions in the world - the Peach Classic! The U.S. Adult Figure Skating Championships (Adult Nationals) are held each year with over 500 competitors from around the country. We have several club members attend each year. and Tina Gravenstein and Anthony David won the Silver Dance event. Rob Lichtefeld won the Silver Mens III Freeskate event in 2010. 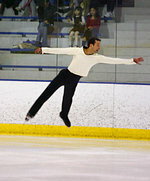 Davin Grindstaff won the Championship Masters Men Freeskate event in 2007. Tina Gravenstein won the Gold Ladies III Freeskate event at the 2007 AN. Renee Lipscomb and Andrew Austin won the gold in 2001 in Championship Dance. There are many different events that are available for adults: Freeskate, Pairs Interpretive, Dance, Solo Dance. We have even had members skate in all adult competitions in Villard-de-Lans, France, Oberstdorff, Germany and Tallinn, Estonia. The Geriatric Figure Skating Crew consists of competitive skaters that belong to either the Georgia Figure Skating Club or the Atlanta Figure Skating Club. This group of adult skaters at the Duluth IceForum regularly go to dinners after practices and even have their own website.